Umami, the concept of the fifth taste originating from Japan, literally means "savoury deliciousness". Clearspring authentic Japanese Umami Paste can be added to unlimited recipes to lift and bring out the ingredients full flavours. Traditionally made by adding a Koji culture to rice and leaving it to naturally ferment, it is then mixed with soya sauce and fresh ginger to create this incredibly moreish and versatile condiment. Soya sauce* (47%) (water; soya beans*, wheat*, sea salt), cultured rice* (28%) (rice*, koji [0.001%]), water, ginger* (3%). Squeeze straight from the pouch into sauces, stews and stir-fries. Mix with olive oil and lemon juice for an umami rich salad dressing. Serve with vegetable sticks as a satisfying savoury dip. Once opened keep refrigerated and consume within 8 months. 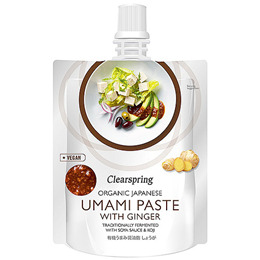 Below are reviews of Clearspring Organic Japanese Umami Paste with Ginger - 150g by bodykind customers. If you have tried this product we'd love to hear what you think so please leave a review.